When she called to tell me, I was excited, of course. But I figured it was one of the emails like I get, listing a dozen or so suggestions based on what I have viewed on their website recently. 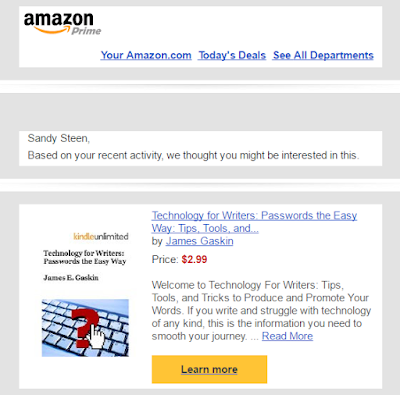 But no, as you can see, the only book recommended was my Technology For Writers. Don't know why they did this, or what the process is that selects such an honor, but I certainly appreciate the attention from them. Since there are no obvious email addresses or phone numbers to say, "Thanks, Amazon," I'm putting this here. And Twitter, of course. Oh, and I guess Facebook - one never knows when Mark Zuckerberg might need help with his passwords. So, once again, let me say, "Thanks, Amazon. Thanks to you and your mysterious algorithms for recommending my book." Does an algorithm appreciate courtesy? Can't hurt.